In this photo, Scooby Doo is representing Tipsy our 1 year old Lhasa Poo who should be aptly named for the untold amounts of mischief she conducts... or so I thought, until this morning when I found our star hiding below a smattering of ribbon rolls. I was elated! I hope that this star will last as long as we can perch it atop our tree. It is representative of our marriage, a shining beacon of what celestial glory we can attain as we place the Lord at the helm of our lives. I love Christmas! In our home, decorating the Christmas tree lasts as long as the season itself. Of course we have one big trimming party to kick start the festivities, but like much of the rest of the season I just can't get enough of it. Plus of course, as the season progresses items are placed on sale, especially whole cranberries, and nothing is better than red strung cranberries on a green Christmas tree. Starting with our first Christmas together we have retained, not only our tradition of keeping our scratch made star, but our tradition of scratch and earth made ornaments for our tree. The smell of fruit and pine couldn't appease my senses more delightfully. In addition to strung cranberries we slice lemons, limes, grapefruit and oranges sprinkled with a little bit of sugar. We leave them to sit overnight, and hang them to dry on the tree throughout the season. The tree lights shine through them and cast a beautiful glow upon the room. 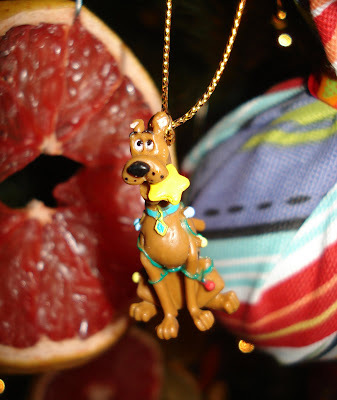 You can see a bit of a grapefruit ornament behind Scooby. For fun, I kept a few limes whole and whipped up a lime tart, but then I ate it just as quickly so I don't have any photos! Cut ingredients together until they resemble small pebbles and then press into tart pan. Pour into crust. Bake at 350° for 12 minutes. Remove and cool. 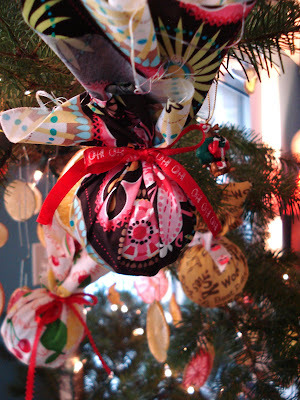 This year, I don't know how I came up with it, I brilliantly thought of wrapping tee balls in my own fabric. I tried for many hours, and then commissioned my husband, and then bought a new hot glue gun to wrap the balls tight with fabric-like store bought ornaments. I now believe that is impossible, so I settled for wrapping them up and tying them with ribbon; I'm thrilled with the results. Fortunately, I also had on hand a delightful assortment of ribbon including Christmas ribbon. Some of the ribbon is polka dotted as you can see, the striped ball has cute little chickens on it, below the yellow ball has gorgeous cupcakes on the ribbon, but most of the ribbon says, "Ho Ho Ho", "Merry Christmas", "I've been good", or Santa is Coming". No glue, tape or staples are involved, so if you like you can unwrap and reuse for alternate purposes. 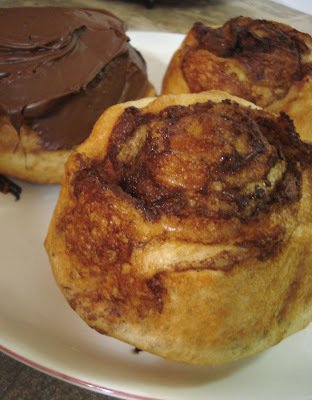 My favorite memories are of any day, any event, any occasion as long as Bammieroo's Orange Rolls were involved, (Bammieroo being my adored Grandmother on my Mom's side as featured in Turkey Lurkey) even funerals. As a member of The Church of Jesus Christ of Latter day Saints we do not view funerals as a sad occasion, but as a joyous opportunity to celebrate a person's life. I didn't know my great Aunt Deltsa, but I remember her funeral because of the orange rolls. I remember everyone laughing and reminiscing as we all wrestled over getting the first glimpse of the Orange Rolls as Bammieroo pulled them out of the oven. We probably ate 4-5 dozen that day and each time laughed and wrestled as they came out of the oven. I remember Bammieroo smiling, commenting how much her sister loved Orange Rolls. 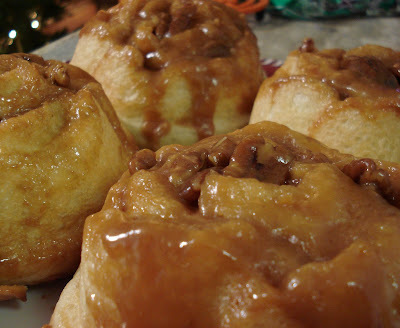 Like German Chocolate Cake, I don't need an excuse to make Orange Rolls and I make them often to appease my senses, or so I can hear oohs and aahs reverberate off the walls when I have dinner guests. 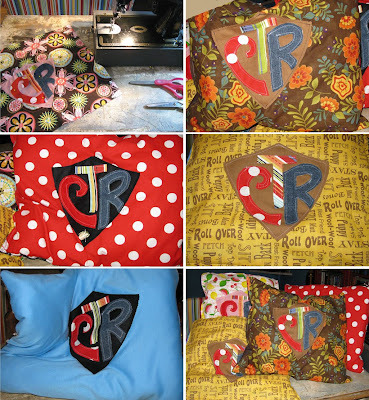 A few years ago my husband and I realized were living in Briar Patch Heaven. It was late August and blackberries were everywhere! We had recently found a large chest freezer on Craigslist and filled it, quite literally to the brim, full of blackberries. I decided to attempt a substitution for my cherished orange rolls, and swapped oranges for blackberries. The results were incalculable! Divine and delicious and delectable. Then I got crazy and attempted a few other variations. The result? Sweet Roses: Choc o làt. First: You need an excellent sweet dough. I will never divulge my Bammieroo's recipe... so sorry! Second: One 8oz. jar of Fahrenheit 350° Sweet Sauce: Choc o làt. Roll out dough to 1/4 inch thick. Spread sauce over dough and roll up tight. 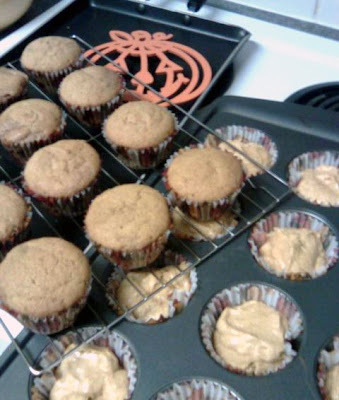 Place in cupcake tins, or desired baking pans - making sure to grease extremely well! Allow to rise double the size and spilling over the tops of the pan. Bake at 350°F until done. 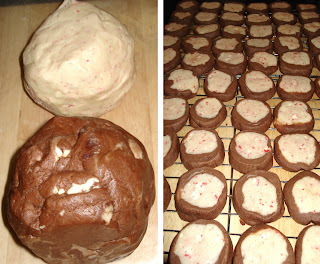 For cupcake tins: 8-10 minutes, for larger pans 19-22 minutes. Remove immediately from pan. While still warm, coat with more Sweet Sauce and enjoy while hot, with a dab of butter on each bite. Another variation is with Fahrenheit 350° Sweet Sauce: Càr à mel. Substitute caramel sauce for chocolate sauce and sprinkle sauce with toasted pecans. Roll up tight and follow recipe same as above. The result? 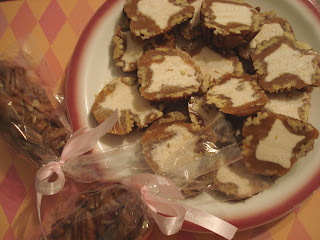 Sweet Roses: Sticky Càr à mel. 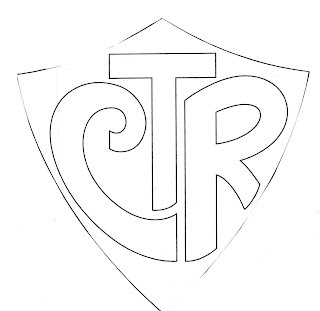 We have been known to throw a couple of pretty sensational parties in our day - all with the same theme: J.J. Abrams. Lost is easily and profoundly, not only the most intelligent television show to air to date, but it is disturbingly entertaining. I possess a compulsory addiction to Lost. I have expelled my theories regarding the island, the wheel, the foot statue, the plane crash, intermediary relations, the conspiracies, philosophical connections, Dharma, and/plus the stations, etc. upon... well if you know me, you. Every Christmas, Gabriel and I write an adorable little diddy for Christmas entitled: "The Go Ahead." It's our version of a family newsletter. A year back, we wrote a story about my missing gray sweat pants... where did we find them? On Sawyer, in episode 26 "Man of Science, Man of Faith". And, one such party is anticipating an arrival date of January 21, 2009. We are all prepared to take work off January 22, because yes, it is going to be that epic. Well, J.J. Abrams has done alright so far with Fringe. Yet, that's all I'm willing to give him until he starts expanding the underlying storyline. However, every week we host a little Fringe party. 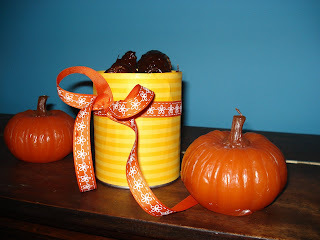 Recently I graced the attending geeks with pumpkin cake, honoring the season, the occasion, and J.J. Abram's genius. You can make these in bars, cake rounds, or cupcakes - I don't play by the rules, so neither should you. 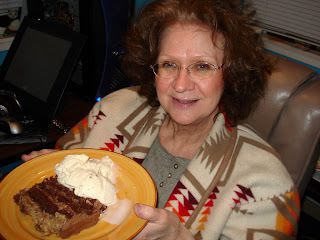 I never need an excuse to make German Chocolate Cake, but every once in a while an excuse does present itself, such as my mother's birthday a few days ago on November 17. 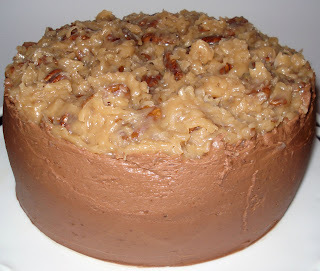 German Chocolate Cake has long been the Johnson cake of choice dating back to at least 1965. 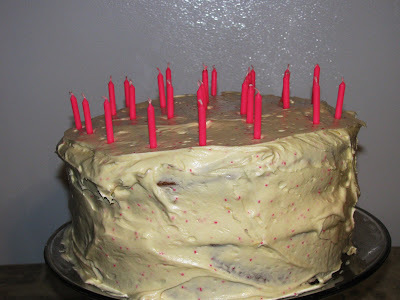 My mother always made a big to do about birthdays! I remember the beautiful bows my mother would adorn our presents with; I remember plenty of meals at The Old Spaghetti Factory; and I remember German Chocolate Cake. My favorite memories are birthday memories, but not just my birthday memories. Since my parent's made such a to do about birthdays they all seemed extra special; especially Michael's birthday on August 25. Even though he left our home to be with our Heavenly Father more than six years ago, we still make a cake in commemoration every year and every year it is German Chocolate. We always knew when Michael's birthday was coming up, because he started a countdown directly after New Years, in January! Needless to say, birthdays are a big to do in my home too! whether you are a pet, a friend, or a family member. Some years we are able to to do more than others depending on the green rubbing off our fingerprints, but no matter what, I can always make a cake! Making German Chocolate Cake this go around, I tried something a wee bit different. 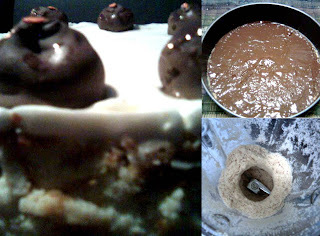 The cake itself and the gravel was all by the book, courtesy of Baker's German Chocolate - the one and only recipe you should ever consider when making German Chocolate cake. 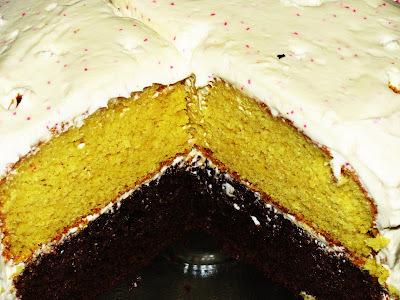 Typically I make 3 cakes, and slice each layer in half. Chocolate frosting goes between each slice, and gravel between both layers, but since we moved and our oven is the size of my thumb, I can now only make two. The chocolate exterior frosting called for a change because dear Ginny is the only person you will ever meet that will not fall comatose, or get tingly tongue when eating highly maniacal amounts of frosting and requests that the edifice contain more frosting than cake. Simple. Take one jar Fahrenheit 350° chocolate sauce, mix with 1 1/2 pounds powdered sugar. To avoid tingly tongue, omit powdered sugar, but you will need to increase amount of chocolate sauce needed. A previous company I worked for held a summer work party in July. Many of my fellow employees would schedule their vacation to coincide with the date of the party; but not me. I made it to the work party every year for 3 years, because every year they had a dessert contest. Every year I strived to win it, and every year I went home miserable and gloomy (I'm the worst kind of sore loser you can imagine). When we moved into our new ward, (The Church of Jesus Christ Of Latter Day Saints) we discovered they held an annual Chili & Dessert Cookoff + CO2 Derby Car Race. It was heaven sent! I had an opportunity to prove myself without any previous held biases against me. I spent weeks deciding what to make, how to display it, how to maximize the number of pieces through cutting styles, and I settled on a favorite recipe of my mothers: Caramel Walnut Flan. The anticipation was grueling... but finally, for the first time, I didn't go home with funeral bags until my eyes! 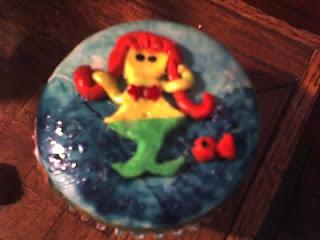 I was the champion baker and I wore my badge of glory proud. So satisfied was I that I had finally won my prize, I barely remembered the date of the party the following year. 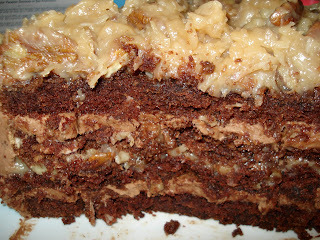 The day of I simply whipped up a German Chocolate Cake and tore into the cookoff 3/4 of the way into it. My efforts were not in vain: I was the prize winner again! This year I went back to step one. 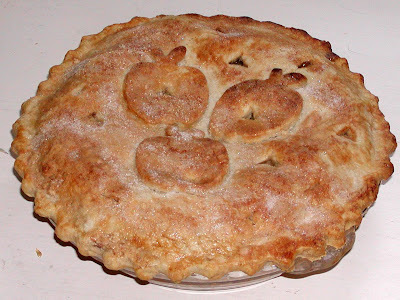 I lamented over what to bake, a revered or new recipe? A comfort dessert, or risk my luck with something out of the ordinary? I finally decided on an amended comfort version of pumpkin cheesecake. Warning: We are back to the camera phone pictures!! 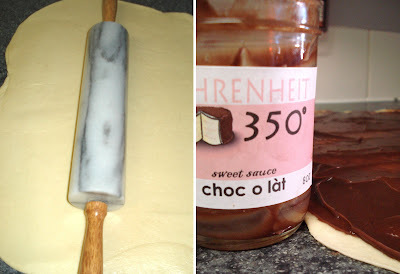 Melt together and press into bottom of pan. Bake for 10 minutes at 325°. I then thought it would be fun to create a layer of chocolate sauce between the crust and the cheesecake, so I layered the crust with a thin layer of Fahrenheit 350° chocolate sauce, (2-3 tablespoons) warmed up a bit. Whip together until smooth. Beat 2 egg whites, fold into mixture. 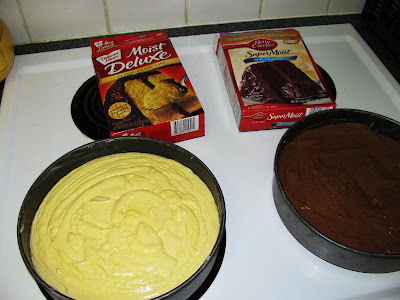 The two cheesecakes will combine when baking so no need to combine or incorporate the two. Bake for 45 minutes at 325°. 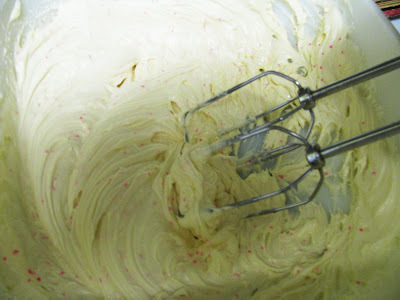 Remove from over and immediately run spatula along sides of pan. When cooled remove outer edge of spring form pan. 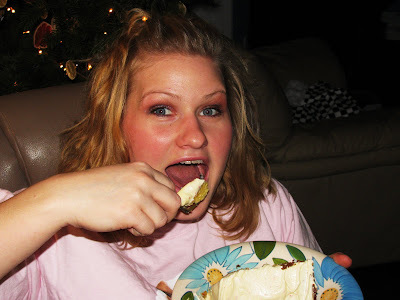 After the cheesecake had cooled I topped with a layer of butter frosting. 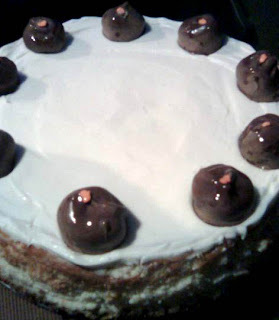 The decorative toppings on the cake are scratch made vanilla chocolates. The center is comprised of a vanilla buttercream and then the candy is dipped in chocolate and topped with a orange pumpkin candy sprinkle. 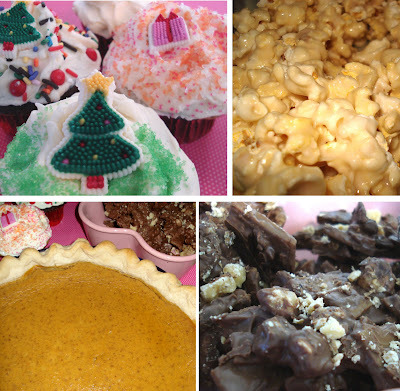 Typically there are 3 winners: Best Crust, Most Fruity, and Best Overall. I wasn't paying attention to all the categories I was just listening for the third name... and when my name wasn't called I'll admit I started falling into my dejected state. The organizer pulled a little trick though and added a third category, Best Texture or something, so my name was called fourth - for Best Overall! Title Defended! When I accepted my golden trophy, I held it up with one hand, raised my other hand into a fist and shouted: "3 years in a row! Whooooooooooooooooooo!" Thursday night Gabriel and I were sitting at our favorite burger dive, Cruisers, talking about how excited we were for Tom and Lucy's Art Shoppe and I commented how much I wished we could go. Gabriel agreed, and we paused to look at each other for a minute. We had just purchased half a tank of gas for $6 and I knew we were thinking the same thing: "Why not?" We are notorious for making midnight trips. One year my good friend Allison Hanna was playing her last college golf tournament in Stanford before she went pro. We hadn't made it to any of her tournaments and I felt guilty and wanted to go. We got off work the night before at 10pm, drove all night, watched the tournament, and drove straight home. About 2 hours away from home we had to pull over and sleep. We learned a valuable lesson that trip: Take turns sleeping and driving, don't both stay awake. We cleaned up, packed, and hit the road at 10:30pm. We told just a few people, none of which included my sister the boutique owner, or my mother who had offered to go to the show to help sell and sample my product. I love surprises! The show was incredible. If you missed it this year, make a note not to miss it next year, times to be announced but it will be sometime between Easter and Mothers Day, and again before Thanksgiving. They had adorable aprons, ballerina shoes and tutu's, crafts, hair clips, baby shoes, onsises! Fahrenheit 350 did excellent! Thank you to Ginny Johnson for her amazing selling skills - we would not have done nearly as well without her! Here is a sample photo of the largest selling item: Sweet Logs, Pecan. http://www.fahrenheit350.com/ to be up next week! well and me of course Fahrenheit 350! As a younger girl I loved playing basketball, particularly on Coach Hanna's All Star Team. Starting in grade school Coach Hanna went around to all the local grade schools in the district and elicited the best girls to compete on a club team, and coached us through junior high. In fact, our team claims the club basketball championship victory of 1995! I sort of had an innocent crush on Coach Hanna; the type of crush you don't really know what it is, just that you know you admire someone and you want to please them because they've assisted in your discovery of finding something that you love. And for basketball I can attribute that to Coach Hanna. One Valentines Day I wanted to express how appreciative I was of him, so I took him some scratch made cookies... with a balloon. Being Valentine's Day, the only balloons they had were love note balloons, and for this I blame my mother. She thought it would be harmless to give Coach an "I love you" balloon. For the record: it wasn't harmless and I lived that decision down everyday until the day I graduated HS, and sometimes even still. Coach Hanna taught us to be very passionate about the game. This was easy for me, I was very passionate about everything. I'm dubbed in my family the: too sensitive one. On the same note, Coach Hanna wasn't always the best example of how to curb that passion. I rarely remember a game that he wasn't ejected from for getting two too many technical fouls. In a few games I also found myself the recipient of a technical foul or two, accompanied by a broken tooth or two. Upon repair of those teeth I was warned by my dentist not to eat toffee or brittle with my front teeth. I offer the same warning to you: Don't eat this brittle with frail front teeth, use those molars and incisors. Allow to reach a temperature of 310°, or hard crack stage and then add cashews, 2 cups give or take. 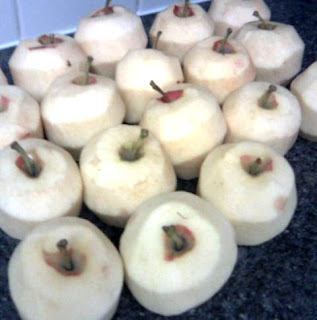 Cook for another 3 to 5 minutes, and remove from heat. 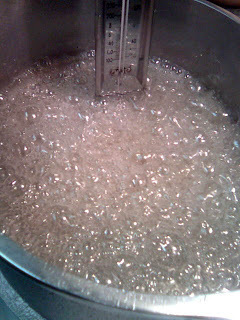 Using a heavy wooden spoon stir until thoroughly mixed and candy stops foaming. 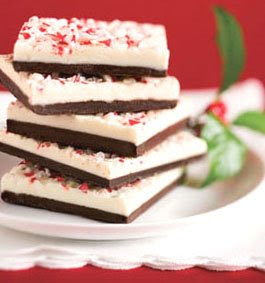 When I made this last, I decided it would be a fantastic idea to pour out my candy onto a buttered marble slab, as I would do with candy fondant or sometimes caramel (though not necessary with caramel), when typically I would butter a cookie sheet and instead pour onto that. 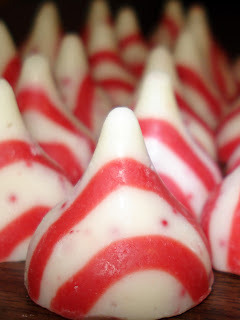 The marble is flat and unmalleable and acts as a suction cup when the candy is poured onto it. Much better to use a candy sheet, trust me. 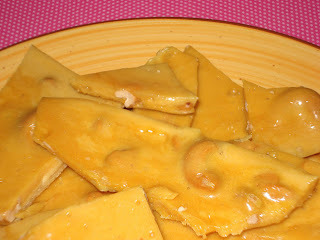 Pour the brittle onto a buttered candy sheet and spread it out. When cool, use the edge of a counter to release the brittle and break into chunks.